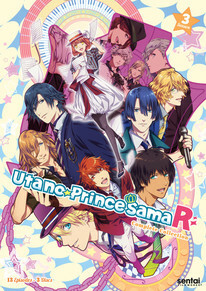 Uta no Prince Sama Revolutions contains episodes 1-13. Get ready for a madcap round of dueling duets as Haruka and the members of the all-male vocal group ST☆RISH find themselves broken down into smaller teams of two! It's part of a plan to help the budding boy band become the star singing attraction at the famous Triple S sports festival, but Haruka and the boys can't help but wonder if being divided into Cross Units won't end up making them cross with each other instead. It doesn't help that the festival's current top pick is the band made up of ST☆RISH's own senior supervisors, QUARTET NIGHT! No matter what motivations their manager Saotome Shining might have for playing mix-and-match with these golden-throated gents, their future is ultimately going to be determined by their loyalty to each other and Haruka's ability to convert everything into song. Music is the most extreme sport and the competition is on in UTA NO PRINCE-SAMA REVOLUTIONS!